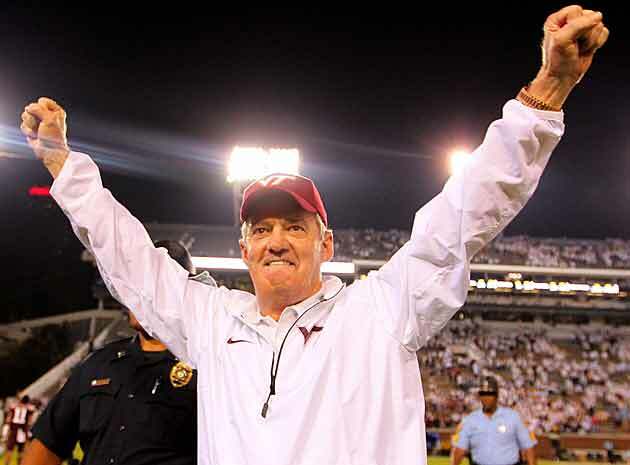 Inside Read: A legend in his twilight, what's next for Va. Tech's Beamer? As Virginia Tech struggles, the Hokies face the vexing question of how long legendary Frank Beamer should remain the coach. Beamer, 68, has the longest tenure (28 years) and most wins (229) of any coach in major college football. No football coach means more to his university than Beamer, whose transcendent place on campus was epitomized by his public role in helping the university recover from the tragic shootings in 2007. But it’s been a difficult season for Virginia Tech (5-6), which needs a win against Virginia (5-6) on Friday to become bowl eligible and has slid into mediocrity the past three years. The Hokies are in sole possession of last place in the ACC Coastal division, and the legendary coach and the program he built into a national power find themselves at a complicated crossroads: How do you handle the departure of a coach who doesn’t live up to the outsized expectations he created? The enduring lesson from Paterno's and Bowden’s messy departures is how difficult it is for legendary coaches to write their own endings gracefully. There’s no glaring indication that Beamer’s job is in imminent danger. But it’s also becoming apparent that Virginia Tech first-year athletic director Whit Babcock needs to have a serious conversation with Beamer about his future and retirement timeline. Beamer has spent much of this injury-riddled season pointing to next year. But the reality is that the Hokies are in last place of the weaker division in the weakest Power Five conference. Looming over the Beamer decision will be the thorny issue of who will succeed him. The leading name would be Arizona coach Rich Rodriguez, who Babcock worked with at West Virginia. Other possibilities from the outside could include Memphis’ Justin Fuente, Kentucky’s Mark Stoops and Clemson assistant Chad Morris. But the tricky part would be dealing with the internal candidates. For the past decade, Tech all-world defensive coordinator Bud Foster was thought to be the favorite for the job. Foster, 55, is considered the top internal candidate and his presence sets a high bar for Virginia Tech, which couldn’t sell the fan base on another defensive coordinator as head coach. (Foster has a clause in his contract where if Beamer leaves and he doesn’t get the job he’s given an $800,000 payment. He receives that payment regardless on Dec. 31 this year.) Frank’s son, Shane, is the associate coach on the Hokies staff, but his candidacy is hurt by his lack of coordinator experience. Babcock has said little publicly about Beamer’s future, but he did sign him to an extension through 2018 before the season. When examined closely, however, the extension proved to be low risk as it showed the university supported Beamer without costing the university anything more in buyout money. (Beamer’s buyout is $2 million spread over eight seasons, which is very reasonable). And that’s what makes the past three seasons so vexing, as the program clearly isn’t trending in the right direction. Since reaching the Sugar Bowl after the 2011 season -- the eighth consecutive year of double-digit victories -- Virginia Tech has gone 20-17, including 11-12 in ACC play. The Virginia game could end two of Beamer’s most impressive streaks -- 21 straight bowl games and 10 consecutive wins over the Cavaliers. There are arguments for both progress and regression in the Tech program. Beamer’s defenders will point out the 13 season-ending injuries, including three tailbacks and five offensive linemen. Those have forced Virginia Tech to play 20 true and redshirt freshmen, a number that explains a season erratic enough to feature a blowout victory at Ohio State and the head-scratching Wake Forest loss. Most important, the losing hasn’t slowed down recruiting, as the Hokies’ class is ranked No. 22 by Rivals.com. The country’s top-ranked recruit -- Chesapeake (Va.) defensive end Josh Sweat -- will make an official visit this weekend. And there’s a feeling in the program that the last two recruiting classes will help Virginia Tech again compete at the highest levels. But there are also signs that the program has been stagnant. Even with the injuries, the talent of the junior and seniors classes isn’t nearly the caliber of what they were five years ago. Excuses of youth and a need to build to next season don’t fly at an established program like Tech. While the injuries have handcuffed the offense, the Hokies have clearly struggled to find an identity on that side of the ball. Beamer demoted offensive coordinator Bryan Stinespring from playcalling duties after the 2010 season. He then fired quarterbacks coach and playcaller Mike O’Cain after the 2012 season. Things have gotten worse the past two seasons under offensive coordinator Scot Loeffler, as the Hokies are No. 100 nationally in total offense and No. 98 in scoring offense this year. There’s no obvious answer at quarterback in the program right now, either. Beamer would seemingly have to overhaul his offensive coaching staff for the third time in five seasons. But could the Hokies lure a top-flight coordinator with Beamer seemingly close to the end of his tenure? Everyone would like Beamer to author a better ending, but can he do it with an offense that couldn’t score in regulation against Wake Forest? Nick Perry thought he would never face a better wide receiver than Julio Jones. Competing against the 6-foot-3, 220-pound Jones in high school and later at Alabama, the Crimson Tide senior safety was taken aback by the highlight reel plays Jones made with his freakish combination of size and speed. “He was a once-in-a-lifetime type of athlete,” Perry told The Inside Read. Perry couldn’t believe that the smaller Cooper was doing the same things as Jones. He’s gotten used to it by now as the junior wide receiver’s dynamic playmaking ability is a big reason Alabama is in the driver’s seat for the inaugural College Football Playoff entering Saturday’s Iron Bowl against Auburn. Cooper is also squarely in the race for the Heisman Trophy with 90 receptions for 1,349 yards with 11 touchdowns, which all lead the SEC and are single-season school records. It’s enough for Perry to bestow heady praise on his teammate, who is expected to leave for the NFL Draft after this season and be a first-round pick like Jones. “He’s definitely the best receiver that I’ve seen play here,” Perry said of Cooper. That’s saying something considering that Jones made the Pro Bowl in 2012 and is currently among the NFL’s leaders in receptions and receiving yards. Perry maintains Cooper is a combination of Jones and former Crimson Tide wide receivers Marquis Maze and Darius Hanks, who were both on NFL rosters. Perry raves about Cooper’s tireless work ethic. While his teammates are relaxing at home or hanging out with friends, Cooper can often be found watching film or running pass routes in Alabama’s indoor facility. “He does little things in the dark that come up in the lights,” Perry said. When Texas players made their way to the team buses after last month’s closer-than-expected 31-26 loss to Oklahoma, they were greeted by cheering Longhorns fans. Until the Sooners converted their lone third down of the game in the final five minutes, first-year Texas coach Charlie Strong and his team were poised for a comeback victory. Since then Texas (6-5) has won four of five games to become bowl eligible. On Thursday night the Longhorns will try to keep that momentum going by spoiling the College Football Playoff hopes of TCU (9-1). Regardless, Strong’s inaugural season will go down as a success as he’s used his toughness approach to start to rebuild an underachieving program defined in the final years of the Mack Brown era by entitlement and mediocre talent. Strong has pulled it off despite losing starting quarterback David Ash to career-ending concussions after his team’s season-opening win, dismissing nine players and having a patchwork offensive line. And Tyrone Swoopes, his new starting quarterback, had thrown all of 13 passes entering this season. • ELLIS: Bowl Projections: Could Baylor make a playoff surge? Perhaps the biggest part of Strong’s reclamation effort has been his team’s confidence. It slowly improved with the increasingly better play of Swoopes, who had his best performance of the season (24 of 33 for 305 yards and two touchdowns) in the Longhorns’ last game, a 28-7 win at Oklahoma State nearly two weeks ago. Strong credits assistant Shawn Watson for his patience with Swoopes, a redshirt sophomore who is still a work-in-progress as a passer. But the biggest difference has been the offensive line, which has been hamstrung by dismissals and injuries. Earlier this season, Swoopes didn’t stay in the pocket to throw the ball and the running backs failed to run hard because none of them trusted the offensive line, according to Strong. The offense’s improvement has given the defense confidence and has helped both sides of the ball in the fourth quarter. The defense hasn’t allowed more than 16 points in the last three games and is 24th nationally in points allowed (21 per game). It all sounds simple enough, but the belief wasn’t there early in the season when the Longhorns were still adjusting to Strong and his new system. It’s also helped that Strong’s seniors have taken ownership and are intent on their legacy being the start of the program’s turnaround. All it took for Texas was a little confidence. The telephone calls sometimes come as early as September, but Wisconsin-Whitewater coach Lance Leipold doesn’t get the messages anymore. The student workers who answer the phone in the football office know better than to ask him which hotel his team will be staying at in December in Salem, Va., the site of the annual NCAA Division III national championship game. Leipold compares the anticipation to how Nebraska and Oklahoma fans used to book trips well in advance to the Orange Bowl, where both teams won national titles. “At a lot of schools, the expectations are there,” Leipold told The Inside Read. But tradition-rich Nebraska or Oklahoma never dominated like Leipold and Wisconsin-Whitewater have at the non-scholarship NCAA Division III level. In eight seasons at his alma mater, he has won five national titles, including last year and three straight from 2009-11. Earlier this season, the 50-year-old Leipold became the fastest coach in NCAA history to reach 100 wins (his career record is 105-6) and he has a 30-1 record in the postseason (his lone loss was in the 2008 national title game). His undefeated and top-ranked Warhawks (11-0) host Wabash (10-1) Saturday in the second round of the NCAA Division III playoffs. As Leipold has filled his hand with national championship rings behind his pro-style offense and stingy defense, he’s increasingly become a candidate for head coaching jobs at higher levels. He’s taken a vagabond path that started with him playing quarterback at Wisconsin-Whitewater (1983-86) and getting his start in coaching with the Warhawks the following year. Leipold bounced around as an assistant at Doane College, an NAIA school in Nebraska, went back to Wisconsin-Whitewater and did two separate stints at Nebraska-Omaha, which closed its football program in 2011. He was also a graduate assistant at Wisconsin under Barry Alvarez (1991-93) and an administrative assistant at Nebraska (2001-03) before getting his current job in 2007. “I’ve tried to run it like a much higher level program,” Leipold said. Leipold is quick to credit his players and staff for Wisconsin-Whitewater’s dynasty. He also points out the school is an affordable option, there’s plenty of in-state talent with no FCS or NCAA Division II football in Wisconsin and that his school benefits from its proximity to Milwaukee, Madison and Chicago. But Leipold’s job has its share of challenges such as aging facilities and his non-scholarship players having to buy items such as their own shoes. Of his assistants, only four have coaching duties in their contracts and they must also teach or advise half of their time. Leipold usually raises as much as two-thirds of his team’s paltry five-figure annual budget. He embraces the challenges, just like he’s come to do with his program’s expectations. The kind in which a family that is a fervent supporter of Wisconsin-Whitewater once told Leipold they had already taken vacation in anticipation of his team playing in the national title game. Leipold’s defense finally failed him last week. Not in his team’s 55-2 trouncing of Macalester College in the first round of the playoffs, but via email. He got a message from a group in Virginia inquiring where his team will be staying for the championship game. Perine (427 yards) topped Wisconsin running back Melvin Gordon’s mark of 408 yards set the week before with a 42-yard run early in the fourth quarter on his 34th carry, his last of the game. Heupel was unaware that history was in the making until it was announced that his star tailback had broken Greg Pruitt’s 43-year-old school record of 294 yards. “It was really pretty and a lot of fun to call and watch from up top,” Heupel said. 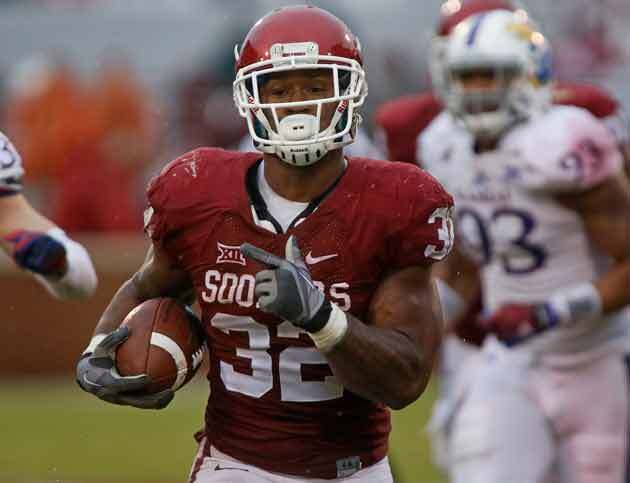 In addition to Perine’s new school records for rushing yards in a half and a game, the 5-11, 243-pound cannonball also ran for five touchdowns to tie Adrian Peterson’s freshman record with 15 TDs. Perine appreciates his teammates, especially his offensive linemen. He bought them pizza earlier this season after a couple of big performances, but upped the ante with Chicken Express this week. • Which college football coach is reminiscent of Alabama’s Nick Saban? It’s first-year Alabama-Birmingham coach Bill Clark. That endorsement comes from Crimson Tide senior safety Nick Perry, who made the unsolicited comparison toward the end of an interview with The Inside Read earlier this week. Perry played for Clark for two years at Prattville (Ala.) High and for the last five years with Saban at Alabama. Both coaches are defensive-minded and Perry has won championships with each. Perry was on the second of Clark’s back-to-back state title teams at Prattville in 2006 and ‘07. He was also on the Crimson Tide’s back-to-back BCS championship teams in 2011 and ‘12. Perry still stays in touch with Clark, who has a 5-6 record in his first year at UAB, a downtrodden program that could be shut down after this season. Like Saban, Clark is also a program-builder. Perry credits Clark for starting Prattville’s dynasty, playing a significant role as defensive coordinator in South Alabama’s transition to the FBS and his major turnaround in taking Jacksonville State to the FCS playoffs last season, his lone year at the school. “Everybody in Alabama really respects him,” Perry said. That sounds just like another football coach in the state. • Locker room renovations and weight room overhauls have become so commonplace in college sports that a visit to campus inherently comes with a hard-hat tour of new construction. But the building boom has also given schools a chance to be creative. In Stanford’s revamped football building, it has included a nice touch that connects its past success with future generations. The Cardinal have a separate section of lockers in their new locker room for their NFL players. That means when Andrew Luck, David DeCastro or Richard Sherman return to work out in the offseason, they have their own personalized locker. The lockers are set apart from the current players, an unspoken sign that they have to keep working to earn a spot there. Shaw chuckled as he mimicked a freshman’s voice. But the personal touches are not lost on Stanford’s former stars. • It’s been a disappointing first season for USC coach Steve Sarkisian, one rife with off-the-field controversy and stinging losses. Before the season even started, cornerback Josh Shaw lied about saving his nephew from drowning and former running back Anthony Brown called Sarkisian “racist” after Brown quit the team. Then came the Trojans’ meltdown in a 37-31 loss at Boston College in September. Throughout it all, Trojans fans have tried to take solace in the future, specifically a recruiting class ranked as high as ninth nationally. But while recruiting services are fawning over USC’s 17 commitments, coaches are puzzled by Sarkisian's and his staff’s recruiting strategy. There’s a belief in coaching circles that Sarkisian and his staff are caving to the pressure of trying to re-establish USC as a power in the recruiting rankings, taking more highly touted recruits instead of lower-rated prospects who could be better players long term. The Trojans gradually dipped in the recruiting rankings under Sarkisian’s predecessor, Lane Kiffin, mainly because of the loss of 30 scholarships over three years as part of the Reggie Bush penalties. The assistant cited Granite Bay, Calif., inside linebacker Cameron Smith and Los Angeles offensive lineman Roy Hemsley, both USC commitments, as examples of players who have more hype than talent. Not that coaches feel sorry for Sarkisian and his recruiting predicament. • NFL scouts expect Saturday to be Indiana running back Tevin Coleman’s final collegiate game. The 6-1, 210-pound junior has quietly had a phenomenal season (1,906 rushing yards and 15 touchdowns on 241 carries) for a 3-8 team that is in the midst of a six-game losing streak. His latest gem was his 228 rushing yards and three touchdowns, one of which was a 90-yarder, in last Saturday’s 42-27 loss at Ohio State. • BECHT: Which potential spoilers could shake up the playoff race? • Just as Wake Forest appeared on its way to a winless ACC season, the Demon Deacons pulled off one of the memorable victories of the college football season last Saturday when they beat Virginia Tech 6-3 in double overtime. It was the first time in an FBS game since 2005 that both teams didn’t score in regulation. Before Saturday, Wake (3-8, 1-6) had shown flickers of promise in Dave Clawson’s first season. The Demon Deacons played with Florida State for a half, led Louisville in the fourth quarter and were tied with Clemson in the fourth quarter. They finally broke through on Saturday. The victory gave an adrenaline shot to the slow burn of the Wake Forest rebuilding job, as it’s following the model of the one Clawson executed at Fordham, Richmond and Bowling Green. Next year, Wake Forest will be among the youngest teams in the nation. Clawson redshirted 15 players this season, and the Demon Deacons will have between 40 and 45 true and redshirt freshmen next year. While Wake Forest will be finding itself in 2015, there’s hope that it could begin turning the corner in 2016 with that core of young but experienced players. The biggest area of need for the Deacons is up front, as they redshirted five offensive linemen and three defensive linemen this year to stabilize for the future. The most promising number may be Wake Forest’s recruiting ranking, which is No. 33 according to Rivals.com (its average ranking was No. 65 the past five years). Even better, Wake hosted on Saturday top prospect Lawrence Cager, a 6-5 receiver from Calvert Hall (Md. ), whose other visits include Ohio State, Virginia Tech and Notre Dame. Georgia Tech’s Paul Johnson hardly hears anymore that his triple-option offense won’t work. In fact, it’s worked just fine for the Yellow Jackets (9-2) this season as they won their fourth ACC Coastal Division title under Johnson. Georgia Tech will play undefeated and defending national champion Florida State in the ACC title game on Dec. 6 in Charlotte and are headed to their seventh straight bowl game under Johnson. As his team prepares to play rival Georgia (9-2) on Saturday, Johnson spoke with The Inside Read about his offense, a Yellow Jackets fan’s unfilled wish and Barack Obama. Your teams are renown for their triple-option offense. How did you get hooked on it? I’ve been doing this since I played in high school. We were a wishbone team and ran the option. Once I got my first head coaching job in 1997 at Georgia Southern (where Johnson won back-to-back NCAA Division I-AA championships) we kind of committed to it and have been tinkering with it ever since. It’s been really good for us. Why’s it so hard to stop? It’s like any offense if you execute it. The one thing about is we’re committed to doing it. I think when you commit to something then hopefully you get good at it. Our kids have embraced it and right now they’re pretty good at running it. (Laughing.) A coaching friend of mine said one time, ‘They don’t hire you to retire you.’ I didn’t pay any attention to it. That’s too bad that he didn’t get his wish I guess. Denver Broncos star wide receiver Demaryius Thomas played for you during your first two years at Georgia Tech. Did he ever make you think twice about passing the ball more? No. (Laughs.) He’s an awfully good player though. He had over 1,000 yards receiving here his senior year so he was a big part of our offense just like DeAndre Smelter is now. We’ve always kind of a go-to receiver since we’ve been here. We’ve been blessed. I think we’ve got three playing in the NFL and we’ve got two this year that are probably going to get drafted. We’re known as an option-school, but we might be Wide Receiver U.
You’re a rare college head coach who didn’t play football in college. Why didn’t you play and was there a benefit to it in terms of your coaching career? When I went to college I just wasn’t big enough to play football quite honestly. When I graduated high school, I was about 145 pounds. I student-taught in college (Western Carolina) and coached my senior year in college (at Tuscola High in Waynesville, N.C.). The key break I got was going back to my high school (Avery County High in Newland, N.C.). The same head coach I played for was there. I was immediately coaching varsity and calling all the plays within two years. That jumpstarted me a little bit. You once said you’d like to trade places for a day with Barack Obama. Why? (Laughs.) It might be a good idea just to get him away for a day. I have some ideas on how I’d like to do things, but the way the political system works, it would probably take a lot longer than a day. You’ve been known to smoke an occasional cigar. When’s the last time you lit one up? Probably the Thursday before we played North Carolina; we didn’t win the game so I haven’t had one since. You also like horse racing, right? I did when I lived in Maryland. Being in Georgia, there’s not a lot of horse racing down here. I’ve been to the Kentucky Derby. I love the horses when I’m around them. It’s fun. I like the excitement, the competition and trying to pick the winners. It’s great. I’ve hit a couple of Pick 6s that paid pretty well. We hit a Pick 6 when I was coaching at Navy with a couple of guys. I think it was at Santa Anita. You could watch it on TV. I think it paid around $32,000. • Arkansas defensive coordinator Robb Smith is fluent in Hoganese. It’s a language that second-year Razorbacks coach Bret Bielema created prior to this past spring for his team to be able to better communicate on the field. Hoganese uses English words, but changes the meaning of them (for example, rose once meant play-action pass). It’s helped Smith install a creative 4-3 scheme that has turned the Arkansas defense into one of the nation’s best in his first season in Fayetteville after it was among the FBS’ worst last year. After surrendering 26.8 points per game in their first seven games, Smith’s unit has given up just 6.7 points in the last four, which includes shutout victories over LSU and Mississippi in the last two week. The first broke the Razorbacks’ 16-game SEC losing streak and the second made the program bowl-eligible for the first time since 2011. Once a graduate assistant when Bielema was an assistant at Iowa, the 39-year-old Smith was an assistant at Maine before joining Greg Schiano’s staff at Rutgers in 2009. He became Rutgers’ defensive coordinator in 2012 after Schiano left to become coach of the Tampa Bay Buccaneers and had a top 10 unit that helped the Scarlet Knights win their first conference title since 1961. Smith joined his former boss in the NFL as his linebackers coach in 2013 and landed his current job after Schiano was fired. He inherited an Arkansas defense that ranked 88th in scoring defense last season (30.8 points per game) and 105th fourth-down conversion defense (nine successful tries in 14 attempts). This year’s unit is 16th (20.2 points per game) and first (just two of 16) in those respective categories. It took a while for the progress to show, but Smith felt his defense had finally started to right itself earlier this month in a 17-10 loss to then-No. 1 Mississippi State. He ended up being correct with the two consecutive shutouts since. “We just needed to eliminate a couple of things and communicate a little better,” Smith said. That’s where the Hoganese comes in. Initially, Bielema taught the language in classes to his players and it was reinforced in respective unit meetings. Smith is a rarity in that he’s an assistant with an economics degree and has a master’s in communications. He jokes that he’s not sure he could draw a supply and demand curve these days. He's not worried about it. After all, he does know Hoganese. • Out of coaching for the first time in 23 years, Darrell Wyatt has had plenty to do. The former Texas co-offensive coordinator and wide receivers coach has been mowing the yard of his Austin home twice a week, taking his daughter, Charese, to high school daily and going to her softball tournaments around the country. “I’ve been busy,” said Wyatt with a laugh. The 48-year-old Wyatt decided to sit out this season because he still had a year left on his contract after not being retained by first-year Longhorns coach Charlie Strong. Since then, Wyatt has been doing consultant work for some coaches and made nearly a dozen visits to further study up-tempo spread offenses at all levels of football. He spent three days with the Denver Broncos and visited North Carolina coach Larry Fedora, who he called plays for at Southern Miss, and Indiana coach Kevin Wilson, who he worked with at Oklahoma. He’s been paying extra close attention to offensive schemes using the pop-pass, often a zone read with a pass option. It’s been popularized by Auburn, where Wyatt’s friend Rhett Lashlee is offensive coordinator. Wyatt plans to return to the sideline during the upcoming coaching cycle, hopefully as a play-caller. His up-tempo spread offenses during his two seasons at Southern Miss were among the nation’s top 20 in different categories. He’s also a legendary recruiter in Texas and has a year of NFL experience coaching wide receivers for Minnesota in 2006. In the meantime, he is watching more college football games than ever. He starts with the early games on Saturdays and doesn’t going to sleep until the West Coast games conclude, diligently taking notes the entire time. “I’ve been really trying to make the best out of this,” Wyatt said. Wyatt took a break one Saturday to do something he’s always wanted to do -- attend a college football tailgate, one flush with brats and burgers. The only problem is that Wyatt became anxious. No wonder Wyatt's been staying busy. Joe Moorhead doesn’t get back to his native Pittsburgh often. But when the third-year Fordham coach does, he makes sure to stop by Primanti Brothers, a chain of sandwich shops throughout the Steel City area that’s been around since 1933. He orders the capicola and cheese sandwich, sweet and sour coleslaw and fries. The 41-year-old Moorhead started eating at Primanti Brothers while he attended Pittsburgh’s Central Catholic High. He and his wife, Jennifer, also a Pittsburgh product, return to their hometown at least once a year. Yet the nearest Primanti Brothers is a few hundred miles from Fordham’s Bronx campus. Moorhead has quietly turned his alma mater back into a budding FCS contender behind his high-octane spread offense. The Rams (10-2) host Sacred Heart (9-2) on Saturday in the first round of the FCS playoffs. But Moorhead continues to hold out hope for his beloved Primanti Brothers after discovering one in Fort Lauderdale while recruiting.